Reflections on CSRA Ten Years in Business gives you three glimpses into why I built a firm to pioneer in experiential social media. I’m amazed that we embarked on our 11th year in February 2017! Here I’ll reflect on where we’ve been and where we’re going. I seem to have an 11 year rhythm. 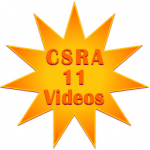 I created CSRA after 11 years at strategy consulting & software firms. I went on my own because I wanted the freedom to address disruption in new ways. Since the 90s, I’d been helping global and local firms transform using technology. I saw that we needed new approaches because not only was more change required but different change. So CSRA was born. The biggest disruption I saw was social media—because it digitizes relationship. I thought that firms could succeed more by using social to connect, not promote, so that’s the approach I took. I did this because, since entering business in the 80s, I’d seen that relationships created better business than marketing or promotion. Meanwhile, most of the world came to use social as a content channel to promote themselves. It’s never surprised me that social has always struggled to prove itself as a profit maker. Firms are leaving most of the money on the table. Here’s a mind-bender. Self-promotion is rarely needed now because trusted people in digital networks connect buyers and sellers. Since choice is infinite, preference is created through emotion and trust, not product information. Most firms still don’t get this. They continue to self-promote, and this hurts their competitiveness more than they know. A lot more. I’ve grateful to have helped all kinds of clients pioneer in social media in these 11 years: global brands, nonprofits, and even a government! Our work has helped me create and refine many methods and tools. Even more exciting, results are showing that using social to build trust with people builds revenue better than marketing. When people trust us, they WANT to work with us, support us, do business with us. So, we’re embarking on our 11th year. We’re explicitly focused on helping firms use experiential social media to develop trust at scale. We mentor clients on interacting in digital public to increase trust and profit. I love mentoring people because I get to see them learn the magic of trust. It’s simple in concept but doing it consistently requires a learning curve. I love seeing how excited clients get! By doing the right thing, in customers’ and employees’ eyes, firms can build business faster and better, and quantitative results support our findings. To wrap up, trust-building is the human way to build business. People love it because we work with them, not against them.